OFFENSIVE BACK - Jacory Harris, Miami, Sr., QB, 6-4, 195, Miami, Fla. Harris threw three touchdowns in Saturday's 49-14 win over Duke. Harris orchestrated scoring plays on the first four possessions of the game for the Canes. The signal-caller was 14-of-20 (70%) for 202 yards and passed for three scores. 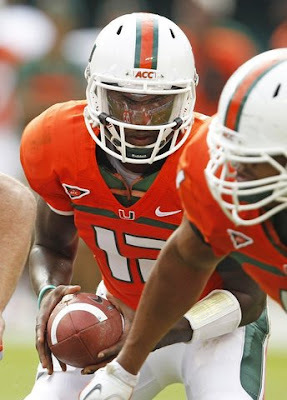 Harris became the second Miami quarterback to pass for 8,000 or more yards in his career. Harris entered the game with 7,895 passing yards and collected 202 against Duke to end with 8,097 yards. With his three touchdown passes, Harris moved into a fourth-place tie in ACC history with 68 career touchdown passes. 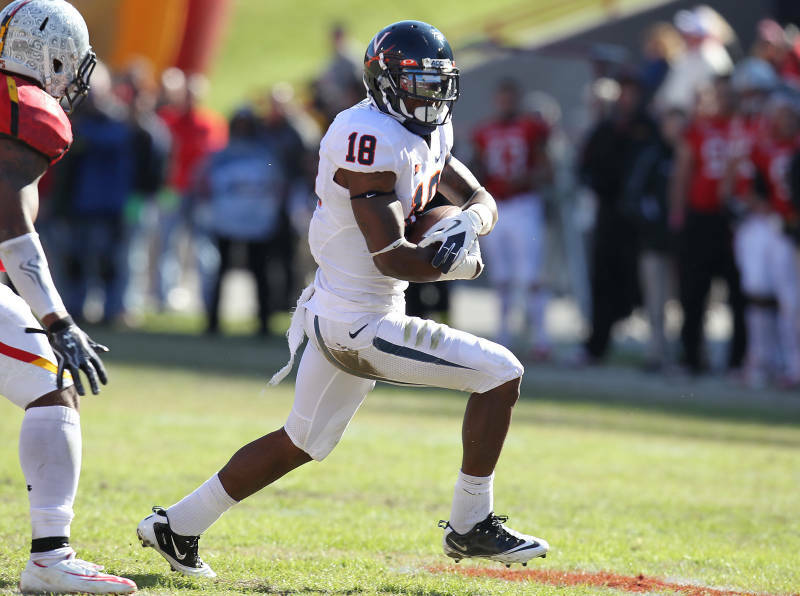 RECEIVER - Kris Burd, Virginia, Sr., WR, 6-1, 200, Matoaca, Va. Kris Burd caught nine passes for 112 yards in Virginia's 31-13 win at Maryland. It was the seventh 100-yard receiving day of his career. The nine receptions were a season high and the 112-yard performance was his second best game this season. CO-OFFENSIVE LINEMAN - Austin Pasztor, Virginia, Sr., OG, 6-7, 305, Langton, Ontario. The senior offensive guard was nearly flawless in Virginia's 31-13 victory at Maryland. Pasztor played 83 plays and graded out at 93 percent. He had six knockdown blocks as the Cavaliers rushed for 220 yards (4.9 yards per carry) and threw for 307 yards while rolling up a season-high 527 yards. Pasztor and the Cavalier line did not allow a sack as quarterback Michael Rocco attempted 36 passes. It marked the second straight game the unit has not allowed a sack. CO-OFFENSIVE LINEMAN - Tyler Horn, Miami, Sr., OL, 6-4, 305, Memphis, Tenn. Tyler Horn helped lead the Miami offense to 467 yards of total offense in a 49-14 win over Duke. The senior center directed an offensive line that did not allow a sack and saw quarterback Jacory Harris pass for three touchdowns and 202 yards. The Canes put up another 265 on the ground, including four scores. With the work of the line, running back Lamar Miller gained 147 yards to go over 1,000 for the season. DEFENSIVE LINEMAN - Anthony McCloud, Florida State, Jr., NG, 6-2, 311, Thomasville, Ga.
McCloud posted a season-high five tackles (4 solos, 1 assist) from his nose guard position as the Seminoles held BC to 94 yards on 39 carries. Florida State ranks third in the nation in rushing defense. McCloud registered a tackle for loss and a forced fumble, dropping Boston College tailback Rolandan Finch for a six-yard loss on the second drive of the game. FSU recovered at the BC 2 and jumped out to a 7-0 lead it never relinquished. In addition to stuffing the run, McCloud's ability to push the pocket contributed to FSU limiting BC to 207 total yards. LINEBACKER - Terrell Manning, NC State, Jr., LB, 6-3, 233, Laurinburg, N.C. Manning had a huge game for the Wolfpack, which shut out UNC for the first time in 51 years. Manning, a junior form Laurinburg, N.C., played 59 snaps and had 11 total tackles, a sack for 12 yards, three pass breakups and three quarterback knockdowns. Manning had three stops on third down and one stop on fourth down, all in the game's final 20 minutes. DEFENSIVE BACK - Rodney McLeod, Virginia, Sr., S, 5-11, 180, Oxon Hill, Md. The Cavalier defensive back had three interceptions (all in the second half in an 18-minute span) in Virginia's 31-13 victory at Maryland. McLeod's first pick came at the Virginia 27-yard yard line after Maryland had driven to the UVa-30 with the Cavaliers holding a 21-13 advantage. 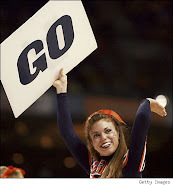 UVa went on to score a TD following the turnover. Both of McLeod's fourth-quarter interceptions came on fourth-down plays, one at the VA 23-yard line and the other at the VA-4 yard line. McLeod also led the Cavaliers in tackles with seven. He becomes the first ACC player this season to record three interceptions. McLeod becomes the first Cavalier to intercept three passes in a game since Anthony Poindexter (current assistant coach) against NC State in 1996. He becomes the fourth BCS player this season to record three interceptions in a single game. SPECIALIST - Wil Baumann, NC State, Fr., P, 6-4, 185, Wilmington, N.C. 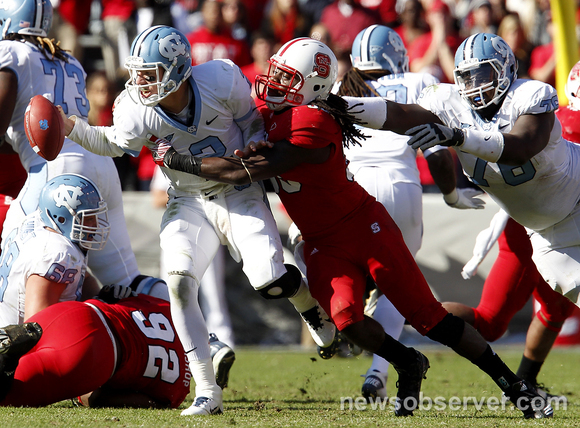 The Wolfpack's freshman punter was invaluable in the victory over the Tar Heels. Baumann, from Wilmington, N.C., punted seven times for an average of 37.9 yards. 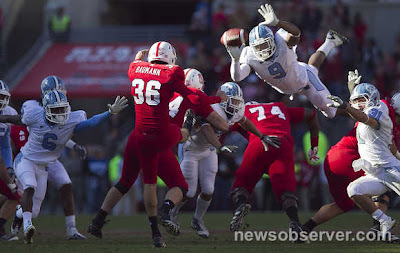 He had five punts inside the UNC 20-yard line, four of which were downed at or inside the 10 (two downed at the 10, two at the 7). North Carolina's average starting field position on its 13 possessions was its own 21. ROOKIE - Nick O'Leary, Florida State, Fr., TE, 6-4, 240, Palm Beach Gardens, Fla. The true freshman led the Seminoles with a career-high 87 receiving yards on three receptions, which also matched his previous single-game best. O'Leary's 58-yard reception of an EJ Manuel pass set up Florida State's third score, good for a 21-0 lead against Boston College. It was the longest reception by an FSU tight end since Lonnie Johnson's 78-yard catch in 1993. O'Leary also had a 23-yard reception which set up FSU's final touchdown of the game early in the fourth quarter.